HKDI was presented The Hague Sculpture signifying the closer exchanges between Hong Kong and the Netherlands Hong Kong Design Institute (HKDI), the first local tertiary institution specialised in design education, was presented a sculpture by The Hague of the Netherlands, a city famed for its rich history of culture and arts. Named “Worlds of Many” and designed by Archipelontwerpers, the award winning architectural office from The Hague, the sculpture symbolised the significance of the existing and forthcoming relations between Hong Kong and The Hague as shown by HKDI and the Royal Academy of Art in the coming exchanges. The Handover Ceremony of the Sculpture was held today (11 December). The Sculpture was presented on behalf of the city of The Hague by Hans van OEL, Chairman of the Creative City of The Hague, to Dr K K LO, Acting Executive Director of VTC, who officiated the ceremony with Jack VERDUYN LUNEL, Director of The Royal Academy of Art, Eric VREEDENBURGH, architect of the sculpture, Anno FEKKES, Director of Visual & Individual Design Experiences (VIDE), the Hon. Victor LO, Chairman of Hong Kong Design Centre and Freeman LAU, Vice Chairman of Hong Kong Design Centre. The design of the sculpture, “Worlds of Many”, was based on algorithms. 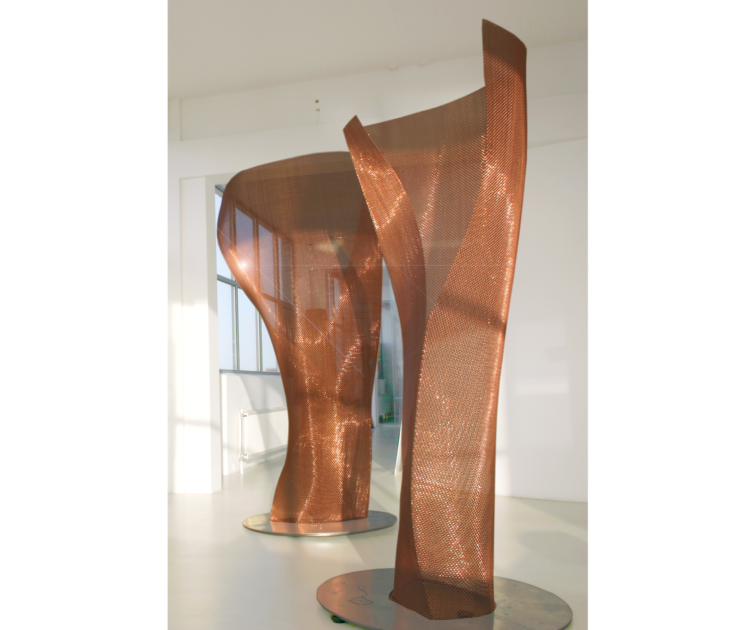 It was created out of woven copperwire which is folded and curved. This material represents the landscape of the dunes and natural beauty protecting The Hague from the sea. The shaping of the material refers to the past and future of The Hague. With new design methods, a fusion of IT based economy and design will arise, creating new worlds to explore for students of HKDI and the Royal Academy of Art, and enabling them to find new ways to become part of the creative industry both in Hong Kong and The Hague. LCD screens are attached to this sculpture which display the versatile and groundbreaking works of the numerous and diverse studios in The Hague, demonstrating their skills in the many disciplines of digital, graphic, fashion, photography, architecture and interior design. The sculpture is the first of a special series created by The Hague for different parts of the world. The “Worlds of Many” will be housed in the brand new campus of HKDI as a source of inspiration for students of the Institute. The Handover Ceremony of the sculpture was held inside the leading design event, Business of Design Week (BODW) in Hong Kong Convention and Exhibition Centre. This year the Netherlands was invited as the partner country of the event. The Hong Kong Design Institute (HKDI) was established in 2007 with the mission to be a leading provider of design education and lifelong learning in design. 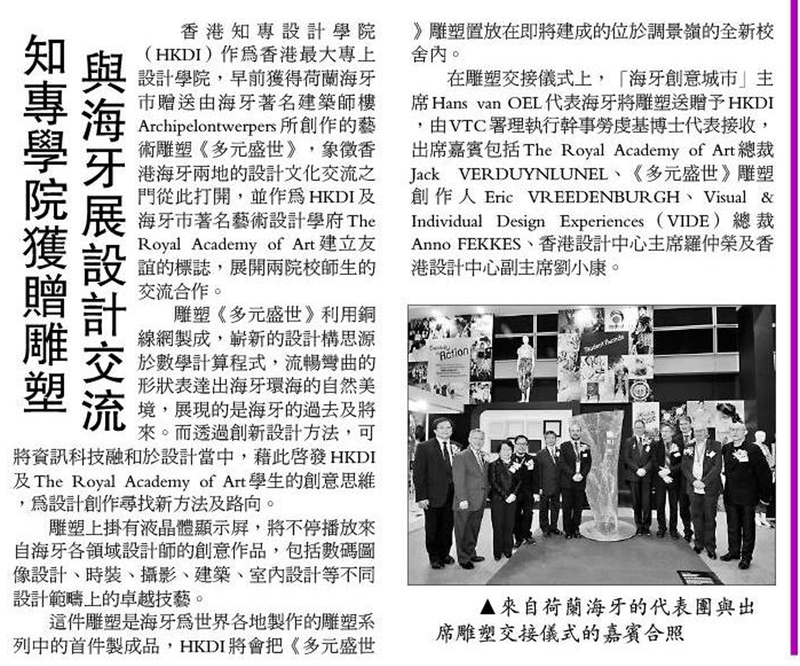 It brings together the strengths of design departments of the Hong Kong Institute of Vocational Education (IVE) to encourage synergy and interdisciplinary thinking in its broad range of design programmes. HKDI maintains a strong network with industry and provides its students with essential practical experience enriched with cultural sensitivities and sustainability. A brand new campus is being built in Tiu Keng Leng to provide a creative, dynamic and vibrant learning environment and is scheduled for completion in 2010. 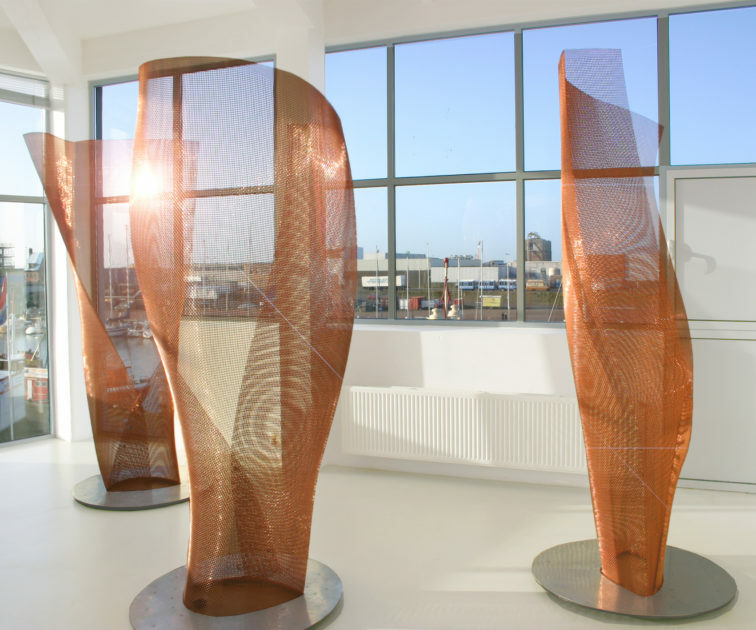 The Sculpture is made of copper wire and is the first prototype of a special series of artificial objects. Artificial means in this context that it is design is based on an algorithms. 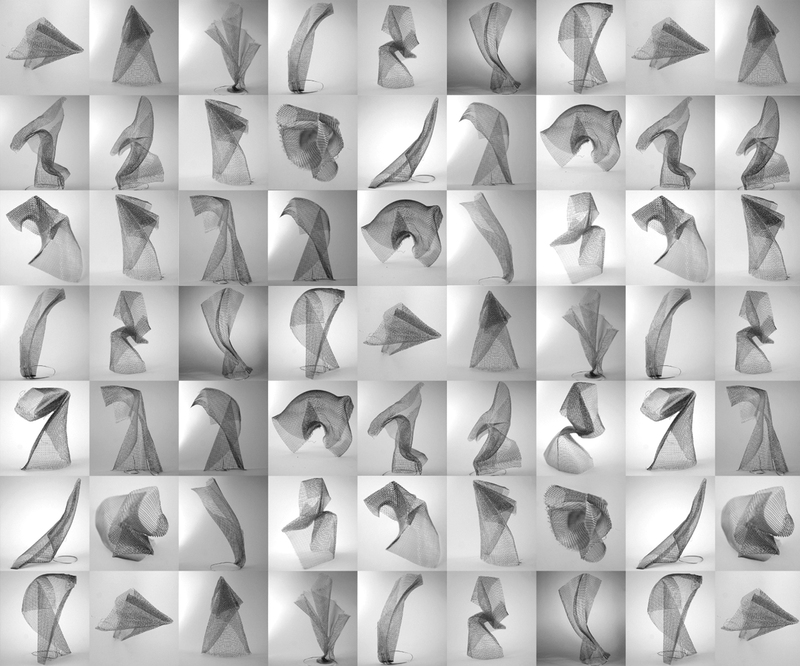 We developed a special algorithm which have generated a random series of forms. One of those has been selected to be made in Hong Kong. Like Hong Kong, The Hague is a city located by the sea but behind the dunes. Parallel to the coastline with these dunes you will find the main roads of the city. These create the back bone of the grid structured city lay-out. The column refers to the geomorphological background of The Hague, her past and her future. The appearance and material refer to the landscape of the dunes and the grid structure of The Hague. The design method refers to the future of the creative industry of The Hague, a fusion of ICT-based economy and design. A centre of Art Science. This object is a kind of pars pro toto, a part of a whole. It is a symbolic piece of The Hague. It is the first of a series and like a seed this object will grow and evolve. Attached to the copper wire in a raw tech manner are lcd screens which show at random the work of various design based studio’s and students. During the next years a new generation of these columns will be produced until the year of 2018, in which The Hague runs for cultural city of Europe.